It tracks the programs you use and alerts you when you stop working. Better than a plain Pomodoro Technique! Windows only. Mac and Linux coming soon :) If you want it sooner, push me with a tweet! The Pomodoro Tecnique is good, but Tomato Alert is even better! It keeps you 100% focused on your work. Select the programs or webs you want to focus on and the maximum time you can waste before an alert. Example: "I want to work in Photoshop and Google Docs and don't want to get distracted for more than 2 minutes". Start working! Tomato Alert will track what you do. 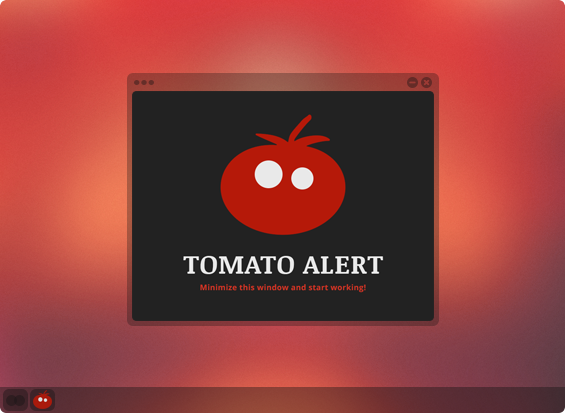 If you spend more than the agreed time using any other program, Tomato Alert will alert you. So simple! Tomato Alert is really easy to use. If you'd like more information or examples then check out the Help Section.